Star Wars: Battlefront II’s journey through the Clone Wars continues tomorrow in the Darth Tyranus Update – and as the the name implies, it’ll see the playable debut of the fallen Jedi Count Dooku. His specialty is direct melee combat with other lightsaber-wielding heroes, but he’s got plenty of other tricks too. 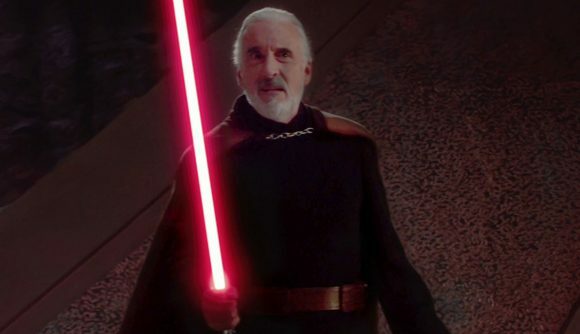 Dooku can deflect lightsaber strikes more easily than other heroes, though he’s slightly less capable when it comes to deflecting blaster bolts. His arsenal includes abilities like Expose Weakness, which targets a single enemy to slow them, boost the damage they take, and mark them for Dooku – if the Sith Lord makes the kill, the ability instantly recharges. Duelist gives Dooku a buff on lightsaber attack speed and damage, and his Dodge has a shorter cooldown than other heroes. He’s also got Lightning Stun, which gives off a quick burst of electricity that throws nearby opponents to the ground. As we saw when EA began teasing some upcoming characters last year, Dooku will be voiced by Corey Burton, just as in the Clone Wars cartoon. Count Dooku arrives on January 23 for 35,000 in-game credits, and that update will also see the Geonosis map extend to Blast, Heroes vs. Villains, and Custom Arcade modes. There are plenty more details in an official Reddit post from the developers. You might note the conspicuous absence of any trailers or screenshots accompanying a major character reveal – apparently approvals for visual assets are quite a process. In the meantime, you can watch a clip from Revenge of the Sith and use your imagination. There’s several new updates left to go on the upcoming road map, including what appears to be the leaked Titan mode from months ago. That’ll launch sometime in February, though we don’t yet have details on what – if any – new updates will follow throughout the rest of 2019.